Vitality Active Rewards is a big deal for Discovery. 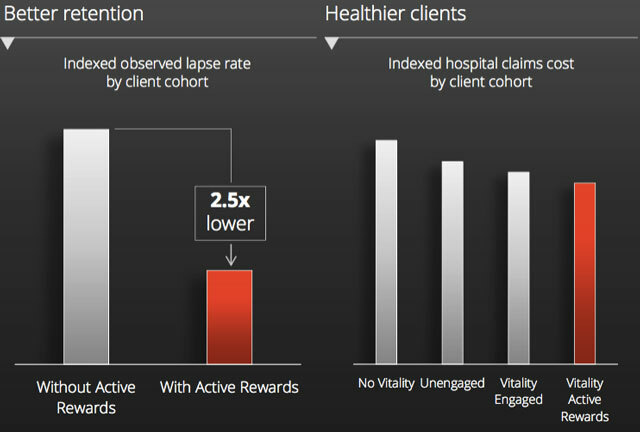 Not only does it offer a way for the insurer to actually keep track of its members’ (largely legitimate) physical activity for the first time — thanks primarily to wearable devices — it is also a means to incentivise far more regular exercise than what was probable under the overall annual-points-equals-discount-tiers system. Think about it: in years past, you’d be able to coast along to gold Vitality status by simply keeping up with your minimum number of gym visits (36 over a rolling 12-month window, which means a pitiful three a month) along with a flurry of in-person assessments and checks in December. Hardly engagement. 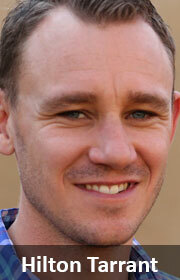 It rather smartly piloted Active Rewards in the UK, before introducing it in South Africa in September. Reach a points goal (tailored to you) every week and you’re rewarded with a free coffee/juice/smoothie from partners. Certainly more carrot than stick: you aren’t forced to sign up and neither are you penalised for not doing so (or not reaching your goals). Members are used to annual revisions to rewards programmes, which is perhaps why the changes from January didn’t cause too much ruckus. But, judging from the uproar a month ago when additional changes were announced (see the “how to earn” breakdown), you’d think these made achieving your goal completely impossible. The thing is, humans, being humans, found all manner of ways to game the system — from strapping fitness trackers to their dogs to simply uploading manual “workouts” through supported apps. No wonder it’s “moving towards verified heart-rate based workouts”. To be sure, Discovery didn’t do the best job in communicating the changes, which took effect this week. And it quietly announced more recently that it would “reset” weekly goals for all members down to 300 points or lower (if your goal was lower). Had it made this clear from the start, more of its members would not have thought the proverbial sky was falling. One can have some sympathy for those on the Apple Watch benefit, who had no idea whether they’d be able to reach their weekly goals — this would have had a direct impact on what they’d pay for their watch monthly (or whether they’d pay at all). I’m not for a second suggesting that everyone must buy an Apple Watch. In fact, the statistics Discovery has publicised show that “almost 200 000” members are “enjoying Active Rewards”. In its results announcement for the six months to December 2015, it disclosed that “over 17 000 Apple Watches” had been sold in less than three months. It’s likely, based on those figures, that roughly one in 10 Active Rewards participants has the device. Many don’t have any wearable tracker at all. 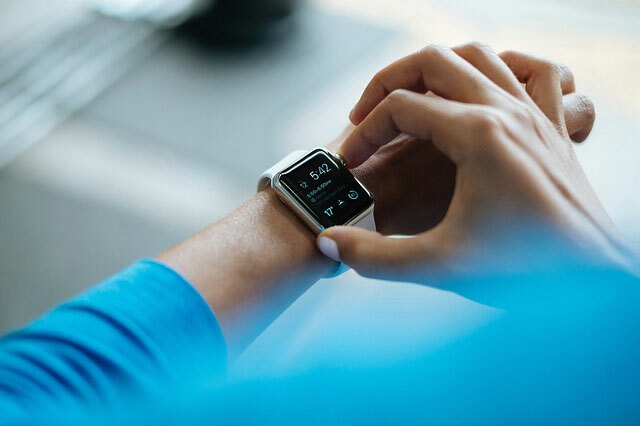 But Discovery, and its partners globally, would be naïve not to take advantage of smartwatches and other wearable devices to better incentivise and track members to live healthier lives. I’m a sucker for gamification, so this weekly points goal appeals to me a lot. In fact, I’ve hit “perfect” months on my Apple Watch nearly every month since I got it in April last year (try achieving a goal of 600 active calories with at least 30 minutes of exercise every day for just one month!). Yes, I’ve been a critic (largely on Twitter) of these April points changes, but on reflection they’ve achieved what Discovery wanted: I’m exercising more. At this point, I’m comfortably managing a 6,5km run inside 30 minutes practically daily (and pushing for 7km). A month ago, I could achieve 5km, and at the start of this year, I could hit anywhere between 3km and 4km, depending on the day. That’s not to say I was unfit and not active. I’m not a sample of one. Discovery points to early data, which “shows an average increase in physical activity of 21% among members”. This has a big impact across a base as large as Vitality’s. The programme isn’t perfect, however. There are two recent revisions that would benefit from a little more effort, thought and research by Discovery. In these April changes, the heart rate for “vigorous” exercise was changed from >70% of your age-related maximum to >80% (see the full table). It cites recommendations by the American College of Sports Medicine and the American Heart Association (the journal paper is here if you feel like falling asleep). In my case (33), that’s meant maintaining an average of >150bpm during physical activity, from >131bpm previously. That’s a big jump, but not necessarily over 30 minutes of exercise (it has meant my runs have gotten quicker and, ideally, less flat). The heart rate for “moderate” exercise was changed from 60% to 70% of your maximum (again, age-related) to 70% to 80% (I would’ve previously “coasted by” at 113bpm). The problem is not the upward revision of what “vigorous” and “moderate” mean. Rather, participating in longer activities like distance running and (particularly) cycling are effectively penalised in this new system. Now, a three-hour-long cycle ride will likely earn you just 300 points — the same as a parkrun or a 30-minute jog. Sustaining physical activity at anything near the rates Discovery’s hoping for over an extended period of time is rare. I’ve looked back at my workout tracking for this year’s Cape Town Cycle Tour, and I just scraped into its definition of vigorous. If it’s an officially timed/verified event (like the Cycle Tour), you’ll get your points regardless, but what about the average Vitality member who spends a few hours in the Cradle on Saturday mornings? Unless they’re sprinting, they’re going to only get those 300 points. An additional level for 180+ minutes of moderate exercise (at 600 points on the above table) would surely solve the problem? Running and cycling tracking app Strava is something of a cult (the social layer, with its strong sense of community is one of the reasons it’s so compelling). Out of all the apps and tracking devices, which Discovery announced it would no longer support from April, the outcry from Strava users was the loudest. But Discovery’s heavy-handed approach of blocking the app as a source of data completely, rather than simply blocking/ignoring any manual workouts logged, was the wrong one. This is a relatively trivial distinction, available from the Strava data which Discovery is accessing. Quite why it didn’t exclude all manual workouts from all sources from the start is a mystery. 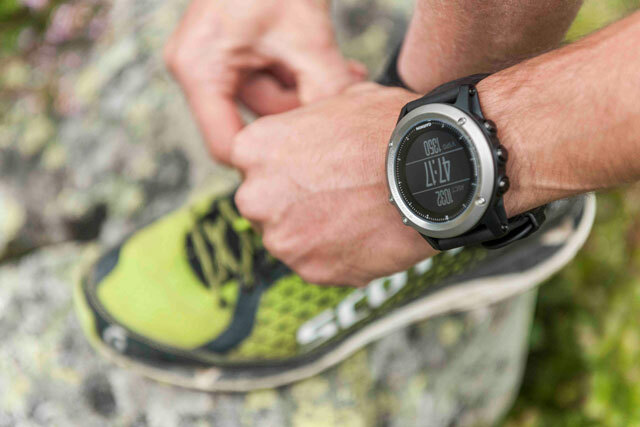 Happily, it says it is working closely with “Strava, Suunto and TomTom to get the required integrations in place to award Vitality points, and we are confident that this will be finalised with all three partners in the coming months”. There’ll be further refinements to Active Rewards in the months and years ahead (like, ahem, ensuring that “vigorous” and “moderate” mean the same thing in South Africa, the UK and US), and you get the sense that the activities and points could be simpler still. There’s no such thing as a “perfect” rewards programme, especially in the field of behavioural economics. But it’s clear that Active Rewards is fast becoming the most important part of Vitality, especially as wearable devices become more pervasive (and more useful). Discovery has a world-beater on its hands. Next Article Can the ANC survive its current crisis? That’s a great idea, but what about swimmers? I am yet to find a good heart rate monitor that can properly track a good swimming session which often times can be more strenuous if you are doing sprints. The polar heart rate band I used to have always slipped off and there are not many water proof watches that are up to the task, unless you spend a whole heap more cash. What about serious weight training. Sounds a bit one sided, but I log the idea and it would be great to activate people more. How do the poorer people get hold of this who may only have a basic medical plan? I used another app which was useful for logging activities like ergo and elliptical. However, now Discovery have stopped using data from phones completely so even if I go into the gym and do a number of activities for more than 30 or even 45 minutes at 90% or above heart rate as measured by a Tom Tom monitor linked to my phone, there is no recognition for that. Now the activity has to be outside, recorded by a GPS fitness device. That is not what I have or where I exercise. The options are now too limited, even if we agree that manual logging should be disallowed. The idea that people would opt in to this gross privacy invasion is truly disturbing. What’s worse is that it has privacy implications for those who don’t opt in. Insurance companies may begin to ask “what have you got to hide?” if people choose not to have their activities monitored? The scariest thing about 1984 is that we appear to be welcoming it. This has been a problem ‘bubbling under the surface’ for a long time. Discovery introduced Blood Glucose Meters for Diabetics that are connected and send your readings to Discovery as well as your doctor. On the surface this seems to be a good idea but only your doctor needs access to this information. Remember that Discovery are responsible for paying for your healthcare (insurance) and not deciding on the treatment, etc. that your doctor decides is best for your medical condition. Imagine if Discovery ‘decide’ to limit your cover and it’s payments based on these readings? Imagine if one day you get a letter from Discovery saying ‘We will limit or cancel your cover because your blood sugar readings are too high’? Imagine if Discovery share this data with other companies and one day you find you can’t get car insurance or one day get refused a job based on information that Discovery ‘sold’ to another company – potentially in the same group as Discovery? And before someone says you sound like you have your tin foil cap on, the below is from the T&C’s of the Active benefits. Carte blanche on giving your data wholesale to any company in Discovery Group… I’m not sure if it would be legal for them to sell it on without your permission. I’m sure it would. The big problem is the wording makes it opt-out, not opt-in. Yup. I’m generally not TOO overly concerned about privacy, but I have lines that I draw, and that’s when it comes to things I can’t change that can be used against me. Like fingerprints – terrible long-term security. Fine for an unlock screen but terrible for payments. A while ago I saw that Discovery were going to offer free DNA sequencing. Now, when people talk about that data, the “nightmare scenario” is insurance companies getting hold of the data. People take a short-term view of it “woohoo, free stuff”, not thinking that once you’ve given that information to someone, you have to assume it’ll be passed around for the rest of your life, out of your control. I found it very disturbing how eagerly everyone embraced the idea of letting your insurance company administer this data. If discovery are serious about it, they’ll reimburse the cost of you getting sequenced in your personal capacity, but I’ll bet that’s not how it’ll go down. People tend to take the “I can’t think of anything they could do with that data that would hurt me” view of privacy, but I’m scared of the things I can’t think of what they might do with it.